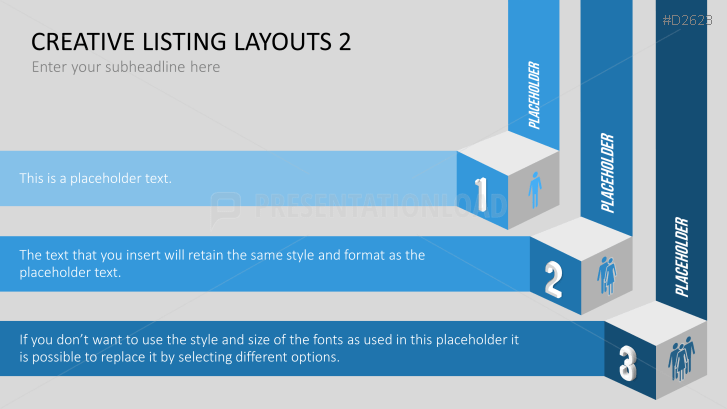 List layouts to display information in PowerPoint. The Creative Lists 2 template set provides a big collection of list layouts and innovative graphics for creative and well-structured presentations that gather a large amount of information. Companies need to process and list as much information as possible to investigate data of stock, products, service, revenue and business processes. The more illustrative such data and content is listed, the more understandable it becomes for clients, business partners and team members. When using predefined graphics and templates, you will create a vivid presentation. Use comprehensive designs and layouts to focus your audience’s attention and to make memorable impressions. The Creative Lists 2 set also includes a variety of list designs and adds additional graphics such as hexagons, arrows and other design variations. Information can be illustrated in circles, with business icons in combination with text boxes and other design elements that complement your visual dressing.